PAINT, CHALK, OR DRAW! Let your toddler's inner artist shine with the DISCOVERY KIDS 3-in-1 Tabletop Dry Erase, Chalkboard, and Painting Easel. 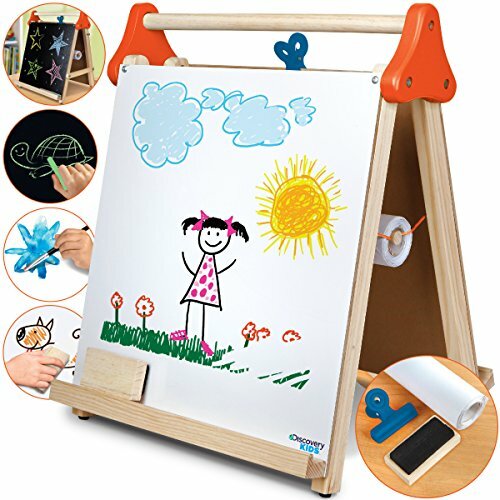 This double-sided whiteboard/black chalkboard easel allows children to make their mark with their favorite paints, chalks, dry erase markers, and much more! It also comes with a dry eraser, paper roll, and oversized clip so your kid can get create a one-of-a-kind masterpiece effortlessly while developing their fine motor skills. PLACE IT ANYWHERE: Kids are always on the go, so why not their art? The easel is crafted to be portable and lightweight for easy travel. When they're ready to get to work, they can turn any surface to an art studio since the easel can be set up on a countertop or tabletop in a flash! GREAT FOR PRESCHOOL TEACHERS: Thanks to the easel's flipchart display, teachers can use the double-sided construction to illustrate drawings, simple equations, and much more with ease. When it's time for art lessons, the built-in paper roll holder can accommodate a 591-inch by 13-inch paper roll for added security and effortless function. EASY STORAGE: When your kid is done for the day, you won't have to fuss about putting away a bulky easel. The 16x20 inch foldable frame is compact enough to be stored in the narrowest of spaces and can even be placed within the provided box for extra safekeeping. DURABLE & LONG LASTING: Surprise your son, daughter, niece, nephew or grandkid with a top-of-the-line easel that's sure to please! The Discovery Kids 3-in-1 Easel is designed with high quality solid wood for extra sturdiness - ensuring long-lasting creative fun!